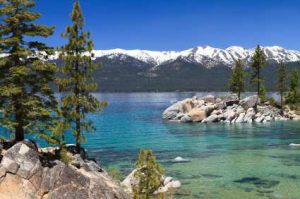 Whether you swim, fish, sail, or simply rest on its shores, you’ll be wowed by the overwhelming beauty of Lake Tahoe, the largest alpine lake in North America. Famous for its cobalt-blue water and surrounding snowcapped peaks, Lake Tahoe straddles the state line between California and Nevada. The border gives this popular Sierra Nevada resort region a split personality. About half its visitors are intent on low-key sightseeing, hiking, camping, and boating. The rest head directly to the Nevada side, where bargain dining, big-name entertainment, and the lure of a jackpot draw them into the glittering casinos. To explore the lake area and get a feel for its many differing communities drive the 72-mile road that follows the shore through wooded flatlands and past beaches, climbing to vistas on the rugged southwest side of the lake and passing through busy commercial developments and casinos on its northeastern and southeastern edges. Another option is to actually go out on the 22-mile-long, 12-mile-wide lake on a sightseeing cruise or kayaking trip. The lake, the communities around it, the state parks, national forests, and protected tracts of wilderness are the region’s main draws, but other nearby destinations are gaining in popularity. Truckee, with an Old West feel and innovative restaurants, entices visitors looking for a relaxed pace and easy access to Tahoe’s north shore and Olympic Valley ski parks. And today Reno, once known only for its casinos, attracts tourists with its buzzing arts scene, revitalized downtown riverfront, and campus events at the University of Nevada. THE LAKE Blue, deep, and alpine pure, Lake Tahoe is far and away the main reason to visit this high Sierra paradise. SKIING Daring black-diamond runs or baby-bunny bumps—whether you’re an expert, a beginner, or somewhere in between, there are many slopes to suit your skills at the numerous Tahoe-area ski parks. THE GREAT OUTDOORS A ring of national forests and recreation areas linked by miles of trails makes Tahoe excellent for nature lovers. DINNER WITH A VIEW You can picnic lakeside at state parks or dine in restaurants perched along the shore. A DATE WITH LADY LUCK Whether you want to roll dice, play the slots, or hope the blackjack dealer goes bust before you do, you’ll find round-the-clock gambling at the casinos on the Nevada side of the lake and in Reno. Lake Tahoe Resort Hotel is one of our premium accommodations in South Lake Tahoe. It is the only all-suite lodging option in the area. Located at the base of Heavenly Mountain Resort and moments from world-class gaming, dining, ice-skating, golf, shopping, hiking, biking, entertainment, and lake activities, our stylish Lake Tahoe accommodations are perfect for families, corporate meetings & retreats, social functions, groups, Lake Tahoe weddings, or an adventure vacation. This location features comfortable two-room suites, free breakfast buffet, and a nightly happy hour.